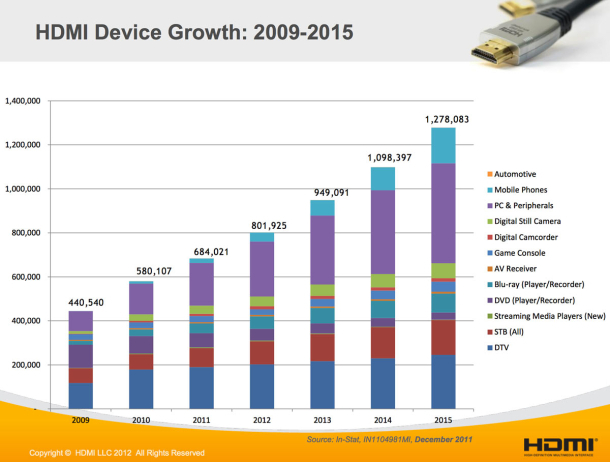 The HDMI Forum just announced the final specifications of the HDMI 2.0 standard, a year later than everyone was expected. The major new feature is of course the 4K support (or 2160p) at 60 frames per second while the old HDMI 1.4 is limited to 30 fps. The new HDMI 2 connection delivers a flow rate of 18 Gb / s and supports up to 32 channels of sound. The HDMI 2 is fully backward compatible with standard format, so we’ll be able to use HDMI 1.4 cables with devices that features the HDMI 2 port. As expected, it would be impossible to convert HDMI 1.4 outputs to HDMI 2 formats. The “high speed” HDMI 1.4 cables that were bought after 2010 will be able to transmit a 4K signal but with some limitations: the 3840×2160 resolution will work only at 30 fps and the 4096×2160 resolution will work at 24 fps. The high transfer rate of 18 GB/s suggests that we’ll be able to transmit two video streams on the same screen.